A few weeks ago, I introduced an annual tradition for me: NaNoWriMo, a challenge that will dare you to write with abandon. The idea of the challenge is to encourage participants to write quickly without getting bogged down in research, planning, or agonizing over details. However, the most efficient way to be able to write like this is to plan out what you are going to do ahead of time. Some people, like me, plan their stories in great detail, while others believe in following inspiration. Either way, it is incredibly helpful to know the three most basic and most important elements before you ever start the first draft. I covered characters two weeks ago in an abnormally in-depth and technical post, and next time I will review plot. This post will deal with the darling of fantasy and science fiction writers - worldbuilding. How many times have you had to stop your productive momentum of writing to do research? Have you been caught up in the bliss of inspiration only to have it all come crashing down as you are forced to spend precious time searching the Internet for some obscure detail, discouraged because you might have to read through the entire Wikipedia page to find a relatively minor fact? I know I have had these problems. Even though I write fantasy, I want it to be as believable as possible, which means I ground my writing in reality. Orson Scott Card's name is on the front, but in reality he only wrote one quarter of the book. 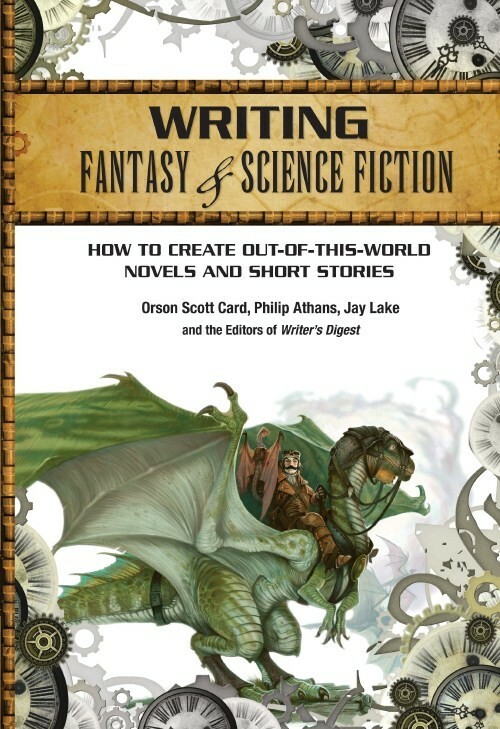 His section is titled "How to Write Science Fiction and Fantasy," and gives a solid overview of good writing, with some important fantasy and science fiction related tips and stipulations. In the next section, Philip Athans shares a history of speculative fiction and its status in modern culture. Jay Lake finishes the first part of the book by speaking specifically to steampunk writers. The real value of this book comes after the first one-third. Many noted speculative authors contributed to "The Writer's Complete Fantasy Reference" - this section makes the book completely worthwhile. It boasts a comprehensive collection of technical information, all conveniently gathered into one book. It is easy to waste valuable time combing the internet for exactly what fabric your middle-class Italian merchant's daughter would wear, whether to call your hero's weapon a mace, a flail, or a morning star, or how a castle siege would affect daily life. If your fantasy is even remotely similar to medieval Europe, there are many resources for you. Read through the section on fantasy cultures - you will find summaries of several different types of government and economic systems, definitions of various titles, and explanations of the important political entities and people groups of the times. The section on commerce, trade, and law covers virtually every European profession and then some, with some elementary explanation of basic economics of the times. Another section, titled "The Anatomy of a Castle," is quite self explanatory, covering the form and function of every element of a medieval castle, with additional information on daily life in the castle. Finally, there is a chapter that guides you through medieval clothing, from fabrics to colors to pieces all sorted by gender and class. Not interested in traditional medieval European fantasy? The section on world cultures covers a dozen kingdoms across the world, from Africa to Asia over the Pacific to North and South America. It shows their economy, politics, religion, and military, to help you understand them well enough to incorporate those lesser-used cultures into your fantasy stories. Other chapters cover magic in all its forms, the practices and effects of witchcraft and paganism, fantasy races from cultures all across the world, and creatures from the myths and legends of virtually every culture. The "Complete Fantasy Reference" is certainly not much of an exaggeration. This book has been an invaluable tool to help me ground my stories in realism without having to search the Internet. 1. Using correct terminology will make you more credible and give your stories life. It seems small, but if you write like you are an expert on your subject, readers will notice. You may not know everything about 16th century London, but if you add some accurate details for flavor, it will help them become more immersed in the world. After all, one of the most important elements of a great fantasy world is a foundation in reality. It will also help readers remember your story, and may help them learn something as well. Correct, specific terminology will help your world feel real and well-developed, and what speculative writer doesn't want that? It seems counter-intuitive to scour what has already been done in order to find new ideas, but this is exactly the way inspiration works. Some people complain about having to learn about story structure, character arcs, character archetypes, theme, and every other supposedly pre-defined aspect of writing. They feel these things force their creativity into the proverbial box and stifle inspiration. My response? "You have to know the rules before you can break them." More often than not, this defines how I like to act: do your research, learn everything there is to learn about your subject, and do it the prescribed "right" way first. The people who have gone before you weren't stupid, after all. Many would balk at this procedure, but at least for me, it works well. I find more inspiration and more creativity when I am trying to work within pre-determined constraints, and the more difficult the problem, the better the solution. Recently, I was struggling with my climax and couldn't figure out how to reach the outcome I wanted. Every action the characters could take swept the story away from the resolution I wanted. My dad helped me brainstorm, and after many good but insufficient ideas, he helped me strike the nugget of gold I had been searching for, and if I had been in a cartoon, a light bulb the size of Texas would have appeared over my head. The result revamped my story and boosted my excitement for weeks afterward. It might just be that my brain is more logically wired than creatively oriented, but I think there is some truth here: don't throw away the "rules" to boost your creativity, instead, embrace them. 3. Look for inspiration everywhere. Although I had done a good chunk of my worldbuilding before finding this book, some of the chapters drove this point home for me. The world cultures, fantasy races, and mythical creatures sections opened my eyes to so many potential ideas buried in the fantastic ideas from cultures around the world. As much as I love a good Tolkien-esque traditional fantasy, that isn't the only type available. My current work-in-progress was inspired by the original dark elves of Norse mythology, which were elf-dwarf hybrids who lived underground because they would turn to stone if the sun touched them. Other ideas have also come from unorthodox places. The fourth module in my 10th grade biology course covered mushrooms, and almost immediately my stately, stone, Gothic underground cities turned into mushroom colonies, with residents eating mushrooms of various types almost exclusively because plants do not grow underground. That same year, I had a friend who was obsessed with Japanese video games and another who was a master martial artist. Their influences on me ended up causing my familiar magical high/light elves to take on a distinct feudal Japanese flavor. Ironically, the frequent spectacular light saber duels in the Star Wars: The Clone Wars animated series convinced me to rethink my automatic use of swords and bows as the primary weapons - my main characters now use maces and spears. No matter where you are, it is easy to find inspiration if you look for it. Don't censor it, either. If you turn ideas over in your mind instead of dismissing some of them out-of-hand as cliche, silly, or unreasonable, you will boost the effectiveness of your inspiration. The "What If?" of unorthodox ideas leads to the most innovative, creative, and intriguing stories. Inspiration isn't necessary for your writing, but will give you the energy and enthusiasm to continue through NaNoWriMo when you are reaching the mid-month slump. NaNo Tips: What Helps You Focus? Where do you find inspiration? Do you find yourself being more creative when you have constraints, or do you prefer complete creative freedom? Do you think worldbuilding is as important as characters, plot, or theme? Let us know in the comments! Note, offsite links may contain a couple of minor curse words. It is the Internet, after all. Nevertheless, I thought these and other links were valuable enough to post anyway. There are so many more posts on worldbuilding. If you want to leave a comment and recommend additions to my list, I will be happy to update it. Another great post for NaNoPrepMo. :) My worldbuilding is going pretty well, but I'm scrambling to figure out all the most important things before NaNo. I can always fill in a few blanks in later drafts, but I need a firm grasp on the basics of my world. It's complex... almost like I'm trying to create an entire imaginary world. ;) As for importance, in my writing, characters and theme are together at the top. After all, theme is what gives the book its depth, and your characters and their arcs are where the theme generally comes into play. Next comes worldbuilding, and then plot, mostly because my plots are always driven by the characters and setting. I create the characters and the culture, and then try to figure out what these particular people will do in this particular environment. However, I know that an argument can be made for starting your planning with almost any aspect of the story. This is just the method that works best for me. I know, I always feel like NaNoPrepMo is way too short... Although if I weren't such a procrastinator, NaNoPrepMo could (and probably should) be several months long. I am glad you enjoyed it! I am glad you found that funny. Whoever decided using a light bulb as the universal symbol of a sudden brilliant idea was a genius... Those ideas hit you so suddenly and so strongly that a light bulb turning on is a perfect metaphor. If I listed every unorthodox place I have found an idea, I would be writing for hours! I am truly amazed at the way the brain can synthesize such wildly different and sometimes seemingly mundane elements into something creative and intriguing. Great post, Hannah! These look like fantastic resources, and I like how you included examples from your own writing. I'm looking forward to the rest of your NaNo-themed posts!